John Stevens Melcher was an up-and-coming attorney on New Year’s Eve 1889 when he married Margaret Greenleaf. His Harvard and Columbia Law School education and the fact that his grandfather was the wealthy and influential Paran Stevens, helped his rapid rise. Within two years he had formed the partnership of Kidder and Melcher. 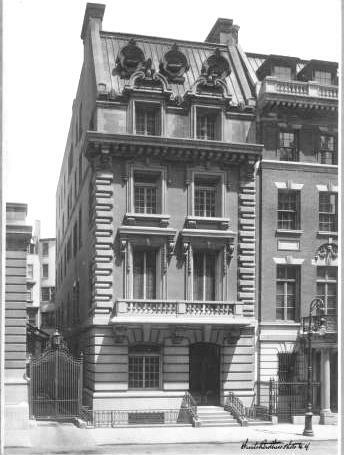 The Melchers moved into a fashionable house at 58 West 11th Street where their two children were born. But tragedy struck in 1899. The 37-year old Margaret became ill and after a prolonged illness, died in her home on May 15. At the time, the Roman Catholic Orphan Asylum engulfed the block of 5th Avenue, between 51st and 52nd Streets. The white marble St. Patrick’s Cathedral loomed on the south side of 51st Street, and on the opposite side of the Avenue sat the George W. Vanderbilt mansion. When the asylum was razed in 1900 the land became available for development. The lots sat squarely in the most exclusive residential neighborhood of Manhattan. But it was a neighborhood that was about to change and the grand homes that would rise along East 51st Street between Fifth Avenue and Madison Avenue would have, perhaps, the shortest lives as private mansions in New York history. On December 20, 1900 Melcher’s father, John Loewell Melcher, died. Before long the attorney began thinking of bringing his widowed mother to live with him. In 1902 he purchased the lot at No. 5 East 51st Street from Henry Lane Eno for the staggering price of $115,000—over $2 million today. Architect Percy Griffin was hired to design the new residence and he turned to the recently popular neo-Georgian style rather than the showier Beaux Arts or French Renaissance styles. Interest in American colonial history was on the upsurge at the time, and was reflected in several brick-and-limestone mansions in the Federal or Georgian style, such as the Andrew Carnegie residence. Griffin produced a five-story red brick structure that held its own among the competing limestone and granite mansions along the block. The entrance at street level above a recently-popular American basement sat within an elegant columned portico that formed a balcony to the French doors at the second floor. The rusticated limestone base sat behind a tall cast iron fence. Above, the brick façade contrasted with the white, splayed keystones nested in the lintels, blank limestone panels and the shallow stone cornice at the fourth floor. The copper-clad dormers of the uppermost story sat behind an elegant carved stone balcony. Griffin gave in to the Beaux Arts trend by stepping away from the colonial design with a carved tympanum above the French doors of the second floor—dripping with garlands, ribbons, fruits and a lion’s head. The house was completed in 1903 and the family moved in – including the widowed Mrs. Stevens. The neighborhood was one of multimillionaires and sleek black carriages. Around the corner was “Vanderbilt Row” where that family’s several mansions lined up for blocks. At the corner of 51st and 5th Avenue the exclusive Union Club had just been completed and Morton Plant’s dazzling mansion was still rising at the opposite corner, at 52nd Street and Fifth Avenue. Undeveloped lots still dotted the block around Melcher’s new home; but within two years the mansions of builder John Peirce; stock broker E. Rollins Morse; and Leila Griswold Webb, the widow of railroad tycoon H. Walter Webb, would fill in the gaps. But four blocks to the north John Jacob Astor, Jr. was building the 19-story St. Regis Hotel. It was the first incursion of “commerce” into the neighborhood of mansions and social clubs. And it was the harbinger of things to come. A year after Melcher moved in he married Helen de Selding on June 3, 1904. Many a society eyebrow was no doubt raised when only seven months later little Elinor Stevens was born. It was at her Maine villa that the 84-year old woman died in September 1908. The house would fill with polite chatter over French teacups and silver flatware as several entertainments were staged. December 10th was the big day when Helen Melcher introduced Margeret to society at a tea in the house. Afterwards there was a small dinner “for which several young men were asked,” said The Times. But the days of glittering social events were soon to come to an end. By 1916 Morton Plant’s magnificent mansion was converted to the store of Cartier jewelers. The same year William Vanderbilt’s twin marble houses became the home of Gimpel & Wildenstein, high-end art dealers and John Pierce’s granite palazzo at No. 11 East 51st Street became an exclusive girls’ school. And so it would be for the John Melcher mansion. By 1919, only 16 years after construction, the home became a private hospital for no more than 25 patients. It was here that year that Princeton graduate John Fine was confined for many months. The elite hospital lasted only a few years and in 1926 the mansion was converted again; this time to a “club house” for the Delta Kappa Epsilon fraternity of Yale College. Unhappily for the fraternity men, Prohibition threatened to dampen their good times. Or at least it would have if they had chosen to obey the new laws. On April 17, 1931 the club was raided by prohibition agents. Three men—two members and an employee-- were arrested and sixty bottles of liquor were taken. The raid was a result of an undercover investigation several days earlier when Deputy U.S. Marshall Aaron Springer visited the club. When he saw the booze being served over the bar and heard a member order a cocktail, he attempted to serve papers. At that point eight men gave him “the bum’s rush” and tossed him out of the club house. The agents returned with search warrants. Two years later the club moved uptown and the once-proud mansion underwent the first of many subsequent transformations. In 1933 the ground floor was renovated as a store with a showroom at the second floor. Each of the upper floors contained five furnished rooms and an elevator was installed. In 1938 “Hamburg Heaven” opened at sidewalk level. Where the Melcher butler once greeted socialites wearing egret-plumed hats, office girls and shoppers now stopped for a Coke and hamburger. Two years later the furnished rooms were remodeled into four apartments per floor, and in 1942 the second and fourth floors were converted to two large apartments per floor. In 1950 the building was altered again—now the second floor housed diamond and jewelry merchants while the upper floors became offices and factories for the jewelers. Two more renovations came about in 1960 and 1968, the last creating offices on the 2nd floor and apartment, once again, above. The building was sold in 2012 and to the shock and disappointment of innumerable New Yorkers Hamburg Heaven, now known as Prime Burger, was told to leave. The new owners will renovate the space for their own purposes. Nice house, good story. and that Mrs. P. Stevens gets around doesn't she? Have you ever done a post on the Union Club on 51st Street? I have not written about the old Union Club yet ... thanks for the nudge!